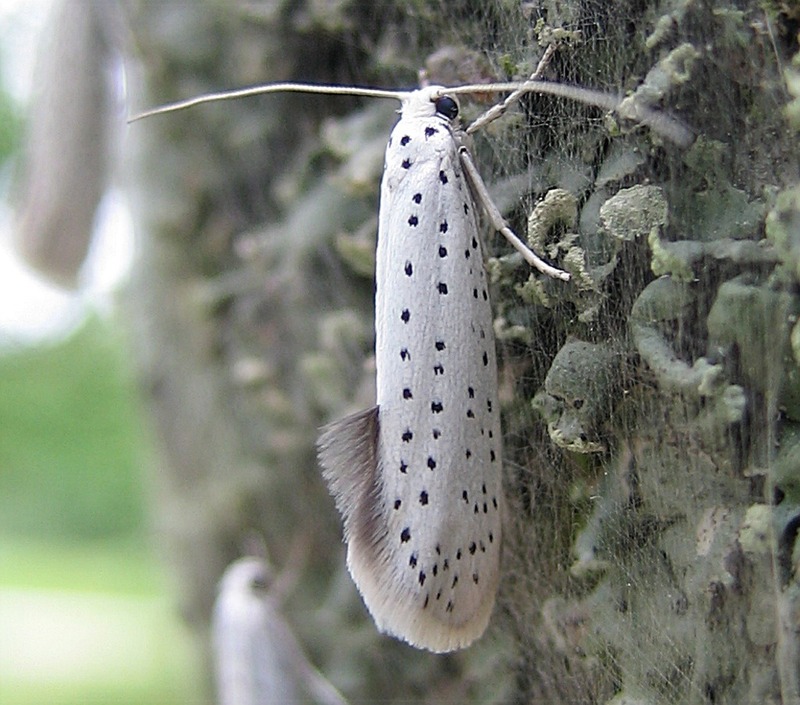 Bookmarks on this page: Bird-cherry Ermine. 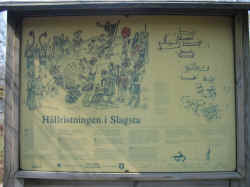 This rock carving were discovered in 1971 during road works for the completion of the residential areas of Norsborg, Hallunda, Slagsta, Fittja, and Alby. The plans for the road were changed, and it was moved a little, so that this trace mark from our ancestors could be preserved. There are people taking a break here, sitting down on the sofa just contemplating, maybe sometimes giving our ancestors a thought. A thought to those who have lived in the area as far back as 7,000 years ago. 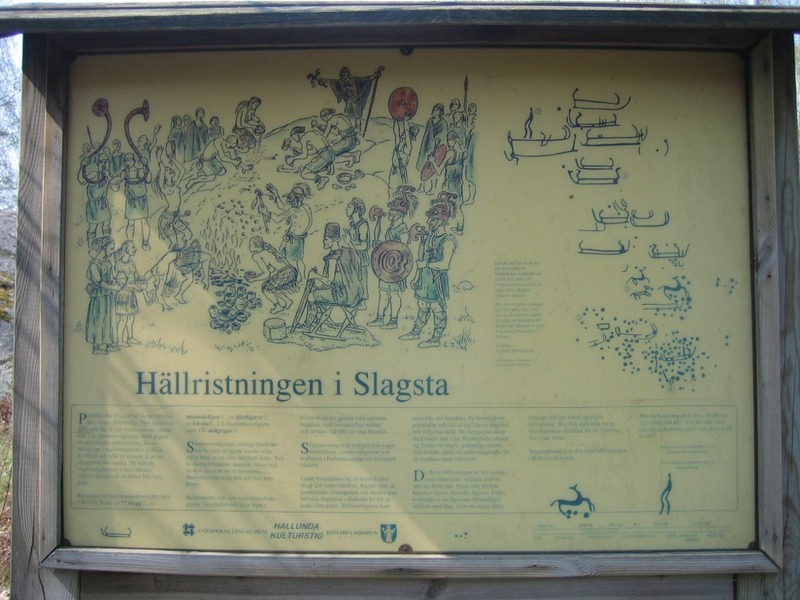 The Slagsta Rock Carving is dated to the Late Bronze Age which in Scandinavia occurred during 1800-500 BC. But the surrounding areas are considered to have inhabited people for about 7,000 years. It is a quite peaceful place despite the location just beside one of the busiest expressways in the country. Much thanks to a noise reducing bank, and a dense grove in between. The “silent asphalt” they used when paving the expressway during 2005 is truly sensational, both to drive on, and for us living within a mile or so from the road. European Prehistoric Art can provide a professional description of this rock carving. Old photographs and descriptions in Swedish chiefly (pdf). A walk and bicycle road to the left, and a parking place here to the right, makes this place so easy to reach, and yet hundreds of thousands of us are rushing by on the expressway, morning and evening, without having the time to give it a thought, what was going on here three thousand years ago. 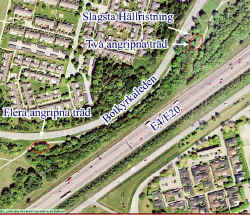 Link to an interactive aerial picture from Eniro. 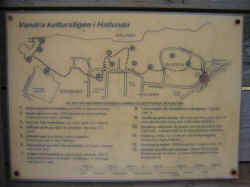 Use it to zoom out and get an idea of where on earth you just have been! 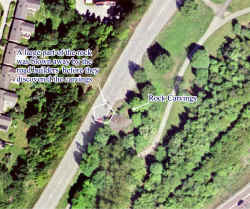 Link for Google Earth users. The local road goes just behind the fence. Most of the carvings are made on the amphibolite surface, surrounded by quartzite, or gneis granite. 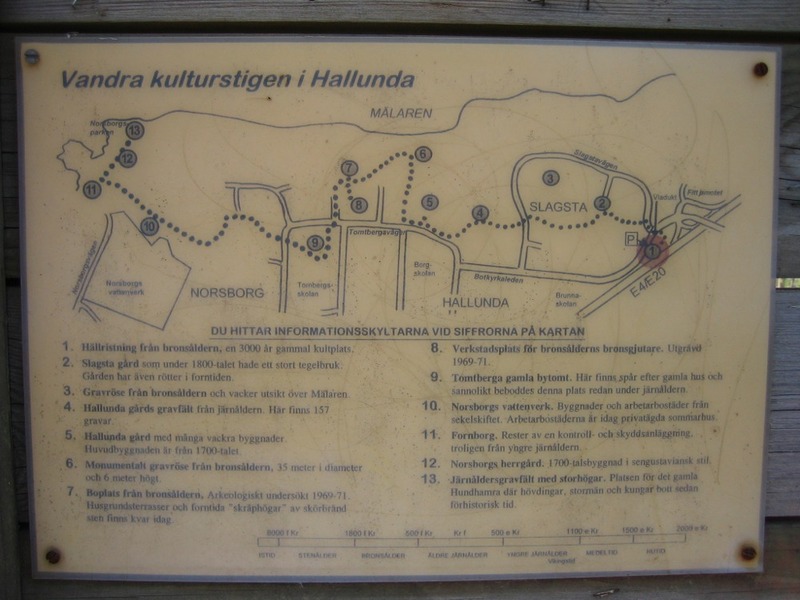 There are 13 significant places with different trace marks along the 3 km so called "Hallunda culture path". 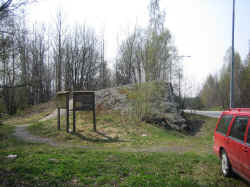 Hallunda Grave Cairn is the sixth place in the path and the last one is The English Park in Norsborg. The lower part of this sign is written in English. Don't take the actions on this picture for granted! Neither the Vendel, nor the Viking era, has to my knowledge shown any evidence for the use of horns on warriors helmets. It's only in the cartoons, and for hockey supporters. A close-up of a cup mark. Well, even the visest among scientists can't unite about wether it is hoarses or deers. I vote for deers, or hoarses, moose, cows? Henrik, You are right! I think your foot sole will fit in to the carving. Is it a rodder down to the left? No, I think it's called a river mill. The picture of the big road sign for our local entrance to the expressway is shown just because it's such a contrast between this 20 by 20 feet large sign of today, and the up to maybe 3000 years old 5 by 12 feet rock carving "sign" at its foot. 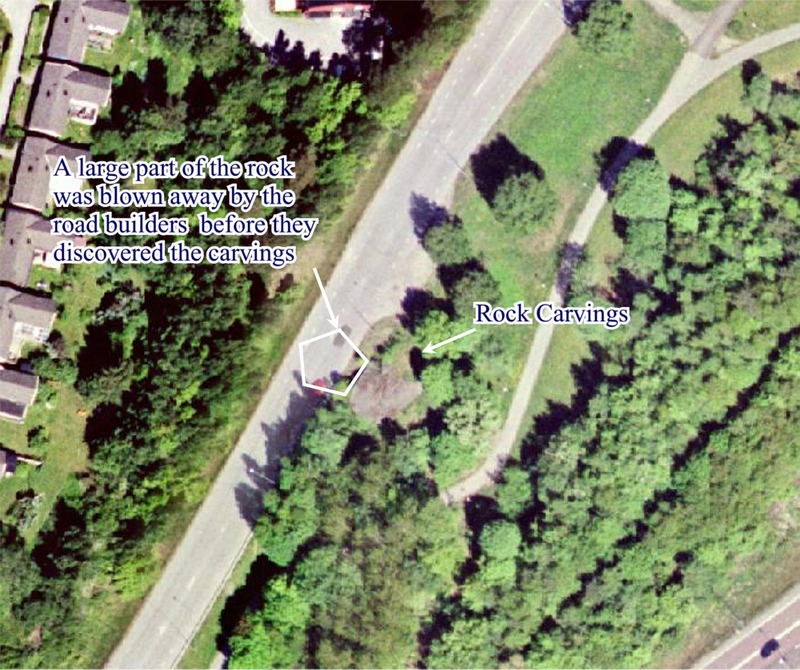 When I pass the rock carvings on my way to and from work, I have noticed something greyish or foggy when looking into the grove surrounding the rock carving. I didn't understand what it was until I ran in to a Bird-Cherry tree outside the entrance of a neighboring company at my work. 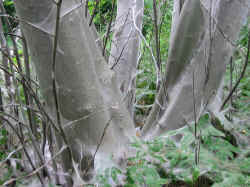 The entire tree was covered with a silk web. 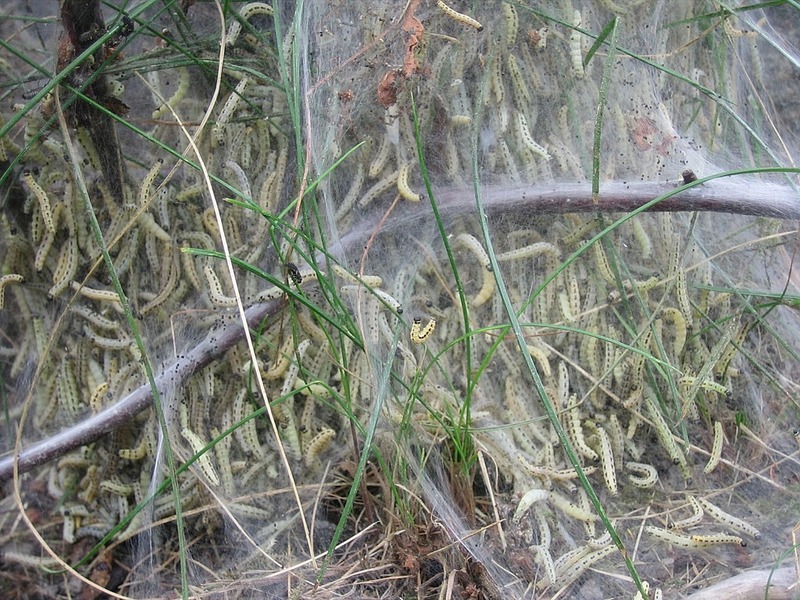 Between the web and the tree trunk there was thousands of larvae of the size a little less than an inch each. The Swedish University of Agricultural Sciences website explained all about it. It's the larvae of the Bird-cherry Ermine, in Swedish Häggspinnmal Yponomeuta evonymella (Linnaeus, 1758). The larvae has eaten all the leaves of the tree. 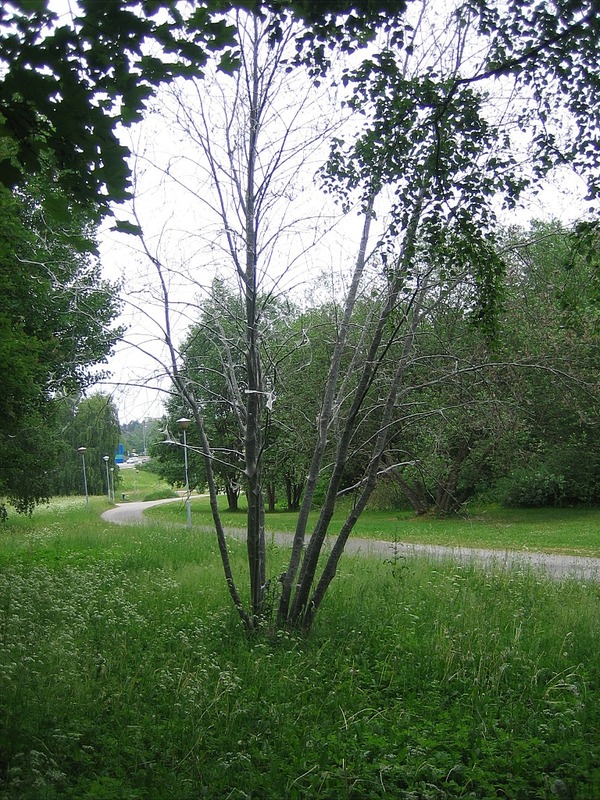 The tree will survive, and even get new leaves already later on this summer. 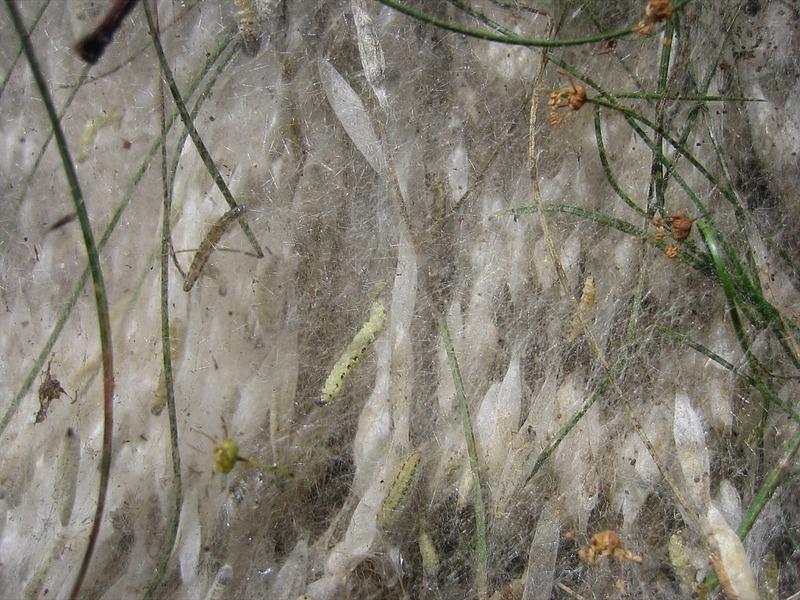 The larvae has now in the end of June woven themselves in to a cocoon, and will in a few weeks time transform to a snow white moth with five rows of brown/black spots on their wings. It's going to be very interesting to see, in due time! These pictures were taken June 20, and June 27. 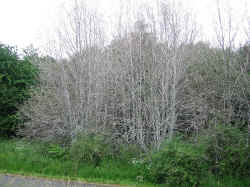 These trees are the very same shown in the 360 degree picture on top of this page. Then they were just sprung in early May. 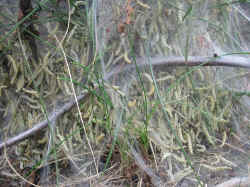 The larvae at the foot of the tree. 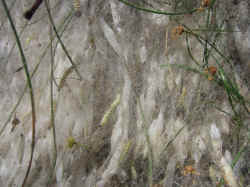 The cocoons seven days later. 400 metres southwest of the stone carving spot. 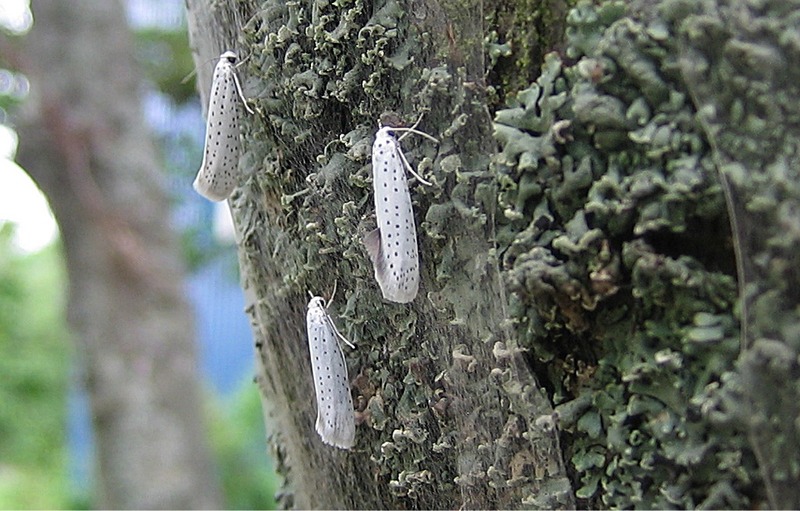 Today July 11, Lots of moths came out of their cocoons. Parts of the cocoon clusters have been falling to the ground. These three pictures are from the same Bird Cherry tree. I believe they had to dry before attempting to fly. 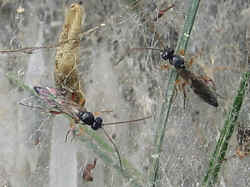 They are not big, just about half to two thirds of an inch, 13-18 mm long. 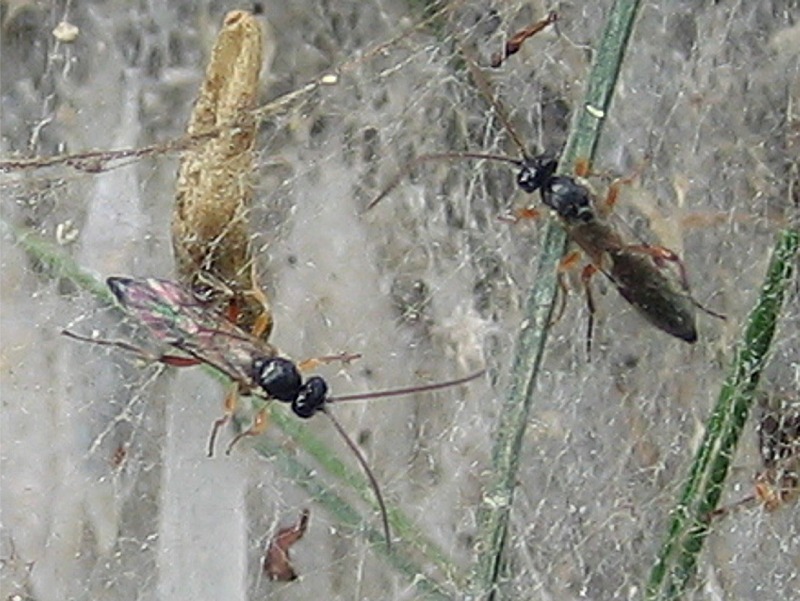 However, These fellas, which I believe are very similar to Spider Wasps, Vägstekel (Road Wasp) in Swedish, which they probably not are, seems to be feeding of the cocoons (or laying their eggs on them) in the first tree I discovered beside my work, and on this tree there were no moths hatched at all. 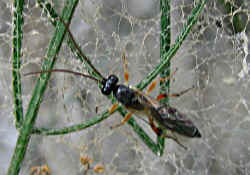 Another close-up of one of the wasps for a possible identification. 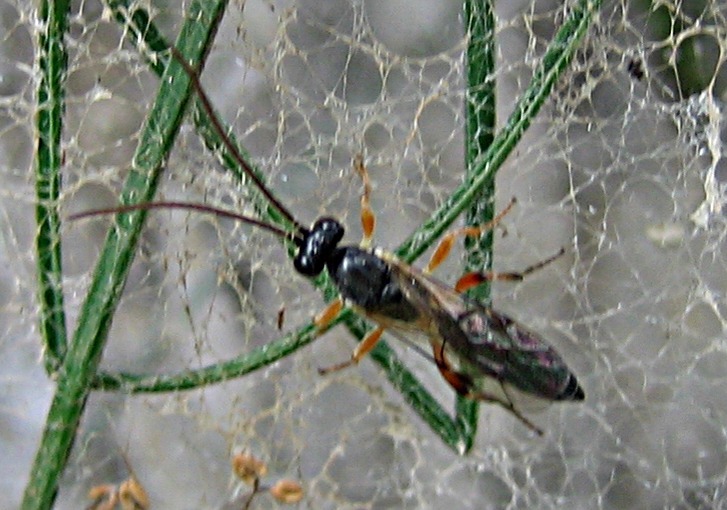 The wasps are about one cm long, less than half an inch. 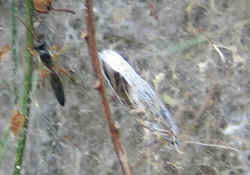 Are the wasps the only natural enemy to the Bird-Cherry Ermine? 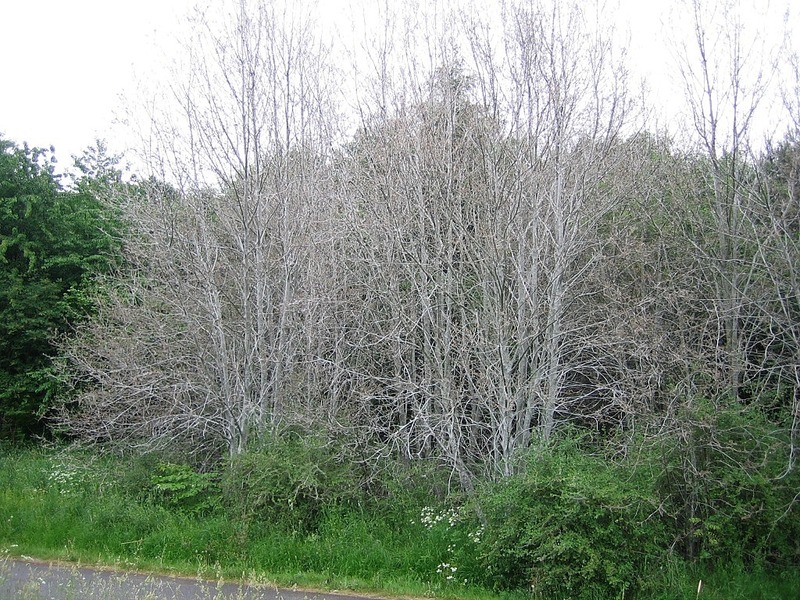 Why didn't the wasps in any of the two locations, pay any attention to the other trees, also full of ermines, and only 10 meters away? 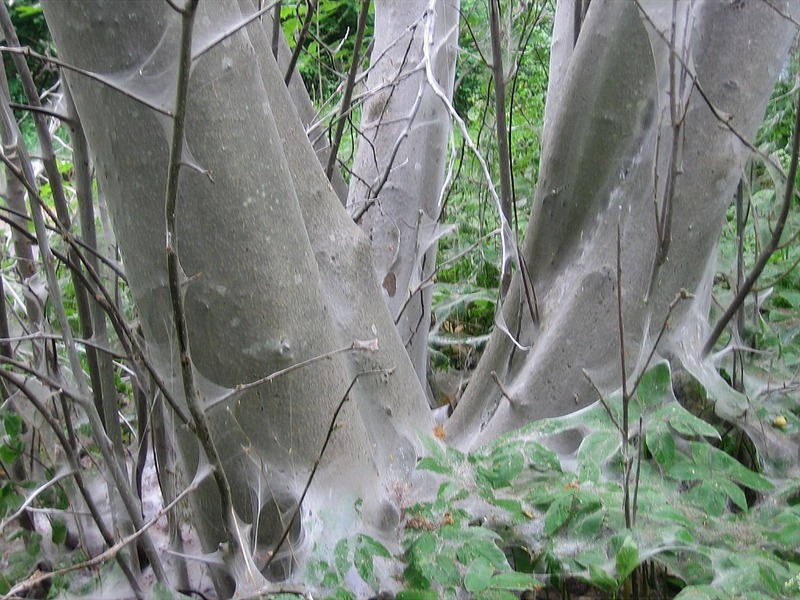 The two Bird-Cherry trees where the ermines settled down at the root of the tree were full of wasps, and no moths. 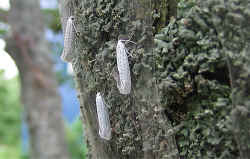 The trees where the ermines made smaller clusters of cocoons in several branches in the crown instead had no wasps, but lots of moths. 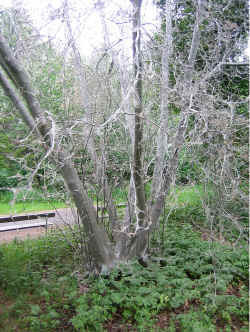 The same at the biggest of the two trees here in Slagsta, no moths, but a lot of wasps. The moth above is dead. 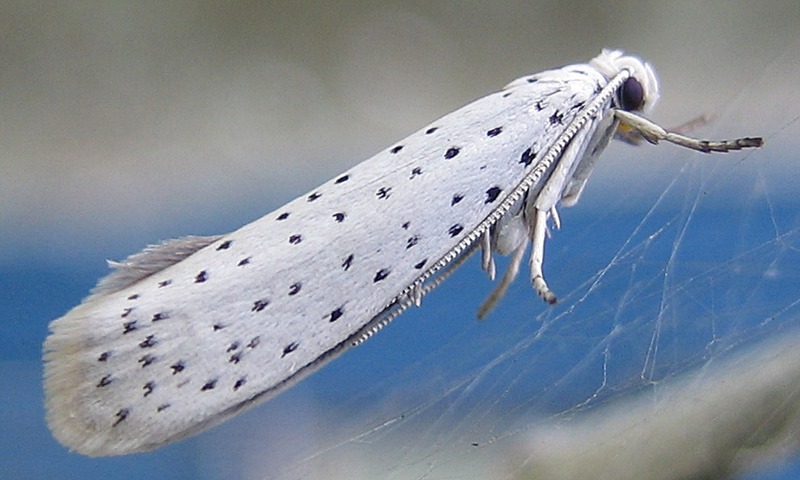 See pictures of the moth, at the Naturhistoriska Riksmuseet. See all reported attacks in Sweden on a map or the latest news (in Swedish only) at the website of Sveriges Lantbruksuniversitet (SLU – the Swedish University of Agricultural Sciences) in the city of Uppsala .